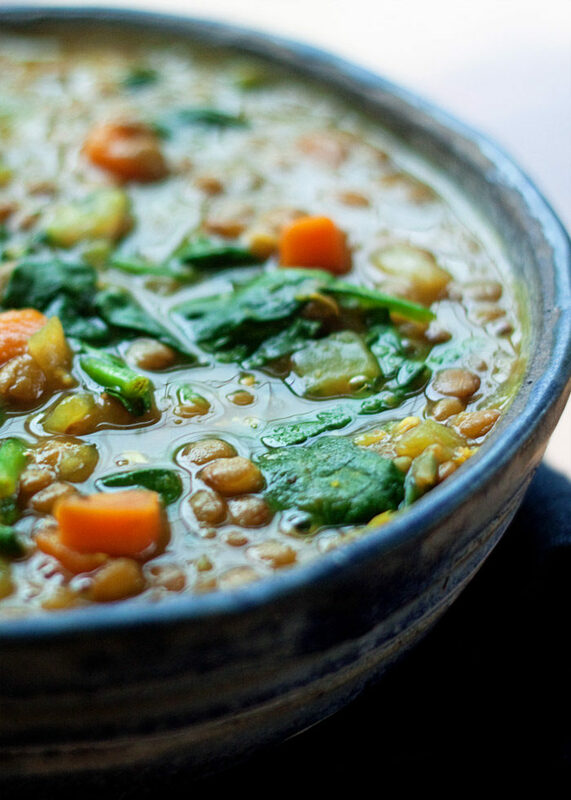 A thick and hearty lentil soup packed full of flavor. Made specifically for the it-appliance of the moment, The Instant Pot! I shared this Instant Pot Lentil Soup recipe nearly two years ago, and it’s been one of my top-most-visited (and top-rated!) recipes ever since. 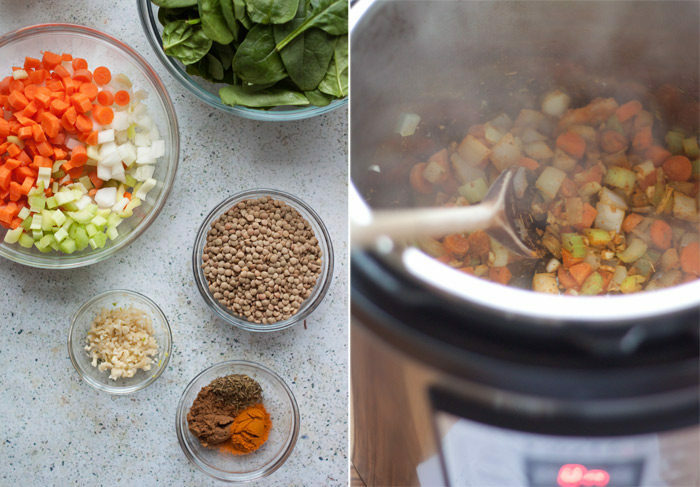 Instant Pot Lentil Soup is the perfect thing to make in your electric pressure cooker – it really is super easy and with that intense cooking environment, the flavors are seriously amped up. If you received an Instant Pot from Santa, read on for the honest thoughts I was having about mine after I got my own a couple of years ago (along with a handful of tips and tricks). 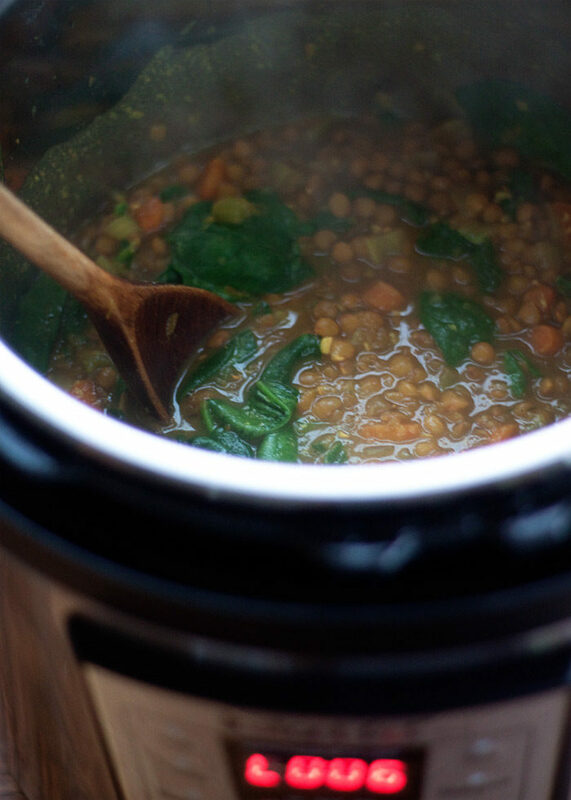 And then break out the lentils, spices, and spinach because this Instant Pot Lentil Soup recipe will be the perfect thing to make first! Add some crusty bread – and a green salad if you like – and you’ve got a seriously comforting wintertime meal. Well, we bought an Instant Pot (finally!) a few weeks ago, and as my friend Laurie says, there’s a definite learning curve. While I am growing to really like this herkin’ new appliance that we have exactly zero counter space for, I have to say it is not the most intuitive to operate. Either that, or I’m really dumb. (I suppose it’s a bit of both). I’ve finally figured out how to both saute and use the manual feature. I’m not sure what the difference is between the manual feature and all the other buttons on there; I tried some of them without much luck. I have figured out that “On” means it’s warming up and then a number on the screen means it’s actually starting to cook and it’s counting down the minutes left. And then the next number on the screen, which apparently says “LO” and then has two numbers on the right, shows it is done cooking and is now on low heat to keep the food warm. The number then counts back up. I’ve also come to terms with the fact that “instant” it is not. Yes, actual cooking time for some items like dried legumes is faster – but sometimes you also have to account for sauteeing (right in the pot, which is nifty), and then there’s the warm-up time, which is usually about 10 minutes, plus you need to add the depressurizing time AFTER it cooks if you’re making a recipe that needs it. My guy and I have decided that the “Instant Pot” should actually be called the “Hands-Off Pot,” because while it may not be the fastest ever, it is definitely zero-maintenance once the lid goes on. Hard-boiled eggs? All they’re cracked up to be, for sure – the peel, indeed, comes clean off with hardly any effort. (I share all about how to make hard-boiled eggs in the Instant Pot here). Rice cooks up like a champ – a little bit faster than stovetop (yay!) and pretty perfect. Steel cut oats in the Instant Pot are the bomb. I love how creamy they come out, and I don’t have to keep stirring them. So, bonus! And then we have this Instant Pot lentil soup with turmeric and spinach and goodness and light (hint: so good). Here’s where the Instant Pot really shines, because while it’s not necessarily intuitive (for me) – or truly instant, for that matter – it does take whole, healthy ingredients and squeeze the most flavor it can out of them. This Instant Pot lentil soup cooks for a mere 12 minutes (not including warm-up time), but it tastes like it simmered all day. Basically, I LOVE THIS SOUP. And, once you know your way around the Instant Pot, it really is super easy to whip up. I call it “golden” because it sports the current it-food, turmeric, which gives it sort of a golden glow. 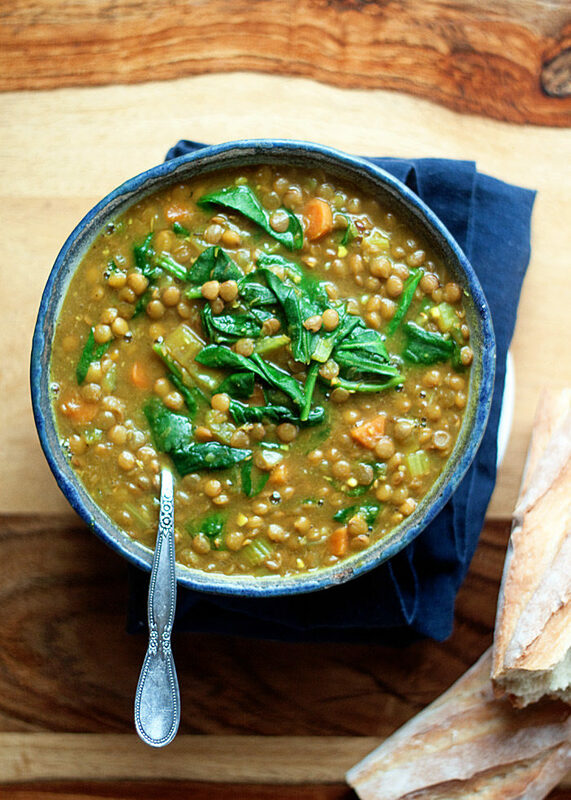 This really is a vibrant lentil soup both looks-wise and taste-wise – it packs a ton of flavor and nutrition and it’s about the coziest dinner around. So my take on the Instant Pot? Overall, it’s a yes. Get one, but keep your expectations in check and know there’s a bit of a learning curve. And then make some of this lentil soup. Instant Pot Vegan Herbed French Lentil Soup – Loaded with herbs (tarragon, parsley, and thyme) with a squeeze of lemon at the end. Thick, hearty and satisfying! Instant Pot Curried Carrot Red Lentil Soup – Another ★★★★★ five-star rated recipe! Split red lentils, carrots, ginger, and curry. This one’s super fast – and full of flavor. Instant Pot Lentil Vegetable Soup. A back-to-basics, hearty, yet full-of-flavor lentil soup with green lentils, carrots, celery, and thyme. Delicious! Q: I tried making it and when I went to open the instant pot the lentils absorbs all of the liquid! I don’t know why that happened! A: Did the Instant Pot seal? I’ve had this happen. I’ve forgotten to make sure my handle is in the “seal” position, or I’ve needed to clean the sealing ring, lid area, float valve, and anti-block shield. Usually one of those things is the culprit. 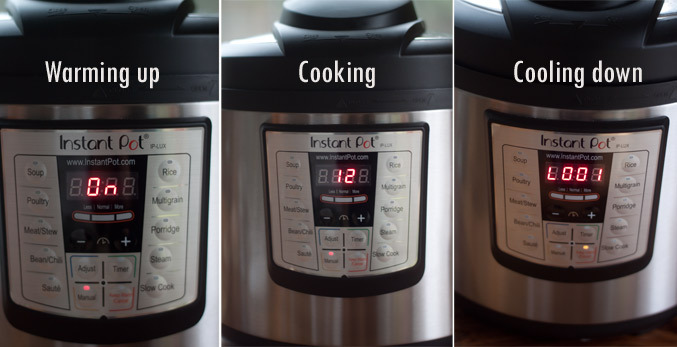 Q: What size Instant Pot are you using? A: I am using a 6-quart Instant Pot. Q: How would you edit this recipe for a 3-quart Instant Pot? A: I have not tried the recipe in a 3-quart, but as long as you don’t double the recipe, everything should be the same. A: I have tried doubling this recipe and while it cooks up just fine, the flavor isn’t quite as nice. I’m honestly not quite sure why that is, but I’m determined to figure it out! Q: Can I use other lentils other than brown lentils? A: Yes! But be prepared to alter your cooking time and know the outcome may be different than what you see in photos. French green lentils would up the time to about 20 minutes. Split red lentils would take more like 8 minutes but they will dissolve as red lentil do. Q: Can I freeze this lentil soup? A: Yes, it freezes beautifully! However, the spinach loses its vibrant color when you freeze it. My suggestion is to freeze without the spinach then add it at the last minute when you warm it back up. Q: Can you make this in a pot on the stove? I haven’t tried it that way yet, but I’m sure you can – I’d say it should take about 35-40 minutes? Q: Is it 12 minutes manual on low or high pressure? Hit “Saute” button on Instant Pot. Add oil. When hot, add the onions, carrots, and celery. Saute, stirring occasionally, until tender, about 5 minutes. Add the garlic, cumin, turmeric, thyme, 1 teaspoon salt, and 1/4 teaspoon pepper and cook, stirring constantly, for one minute. Add the lentils and pour in the broth. Stir. Place the lid on the Instant Pot and make sure the release valve is in the “sealing” position. Press the “Manual” button and set the timer at 12 minutes. The Instant Pot will warm up for about 10 minutes and then start cooking. After the 12 minutes is up, quick-release by flipping the release valve to “venting” (a little bit at a time at first). Once venting is complete, remove the lid of the Instant Pot. Stir in the spinach. Taste and add additional salt and pepper if desired. Serve. Keeps in the refrigerator for about 3 days. Freezes well too! Cook time includes sautéing and warm-up. Originally published January 7, 2017. Last updated December 27, 2018. I put the spinach in the insta pot right??? If I have a 3qt how do I edit the recipe and timing? Thanks!! I made this last night using my Instant Pot for the very first time. This recipe was very simple to make, the IP directions were clear, and the soup came out delicious. Thanks so much for your review, Lacey! I’m so glad you liked it. I’d love to hear your thoughts on the learning curve involved in cooking with the Insta Pot. I’ve been toying with getting one for about a year and a half, but space, among other considerations, has kept me from buying one. What works? What’s been tricky to adapt to? Would love to read your insights and experiences in a column! For me, I noticed there was a learning curve with the timing. It is not an Instant heat up, once you set the pressure cooking function it still takes a good few minutes to actually achieve pressure and start your countdown. I also noticed there was a learning curve with the buttons, because there are simply so many options. Absolutely delicious. 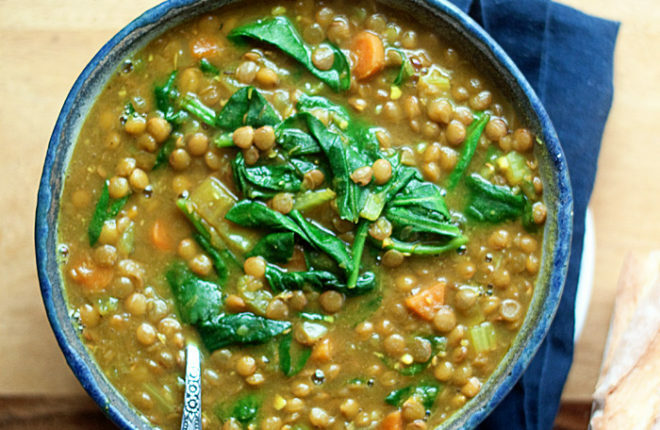 I already love lentil soup, but this has such amazing flavor!! I used this recipe for my very first time using my new instant pot. It was so easy and turned out amazing. Thank you so much for sharing!! Hi Hope! I’m so glad you liked this recipe. Thanks so much for the review! Love the idea of eating this for New Year’s! And sherry vinegar sounds like a delicious addition. Thanks for sharing! Very flavorful! Turned out great, family enjoyed it! Would recommend adding a little cayenne at end. Love the little punch of cayenne! Very nice recipe and now I understand my Instant Pot better. So glad you liked it! The IP is a bit of a beast to get to know (at least it was for me) but so worth it! My family loved it. It was great! Very good! Thank you for sharing this recipe. I made it just as you suggested except I added some frozen peas in at the end with the spinach. It is delicious. Yay, I’m so glad you liked it! Thanks so much for coming back and rating the recipe. Making this for the second time tonight! Turned out great. My only disappointment was that i didnt make enough for leftovers. This time i’m doubling the recipe for leftovers! Thanks for the recipe! I’m so glad you like the recipe, Kara! 🙂 Thanks! I made this tonight and ran into the issue of the liquid being fully absorbed. It was still delicious nonetheless! My husband loved it as well. I’ll definitely try it again. So simple and flavorful. Strange! Did your Instant Pot seal? This has happened to me when the pot never seals. I made this for dinner the other night and everyone LOVED it! So easy and flavorful; thank you for sharing! Yay! Love it. Thanks Caroline! Thanks for the rating! So glad you liked it. This was absolutely delicious. I didn’t have veg broth, so I did it with chicken broth (if you do this, I suggest reducing the salt you add), also I had no spinach, but despite this IT WAS FABULOUS. My husband and I almost ate the whole pot! This was very tasty! I ran out of vegetable broth and had to substitute 2 cups of water and it still turned out really delicious and not lacking any flavor at all. In fact, if anything, I would cut down a bit on the salt and I generally like a lot of salt. I also threw in cubes of roasted squash I had in the fridge. This was my second instant pot dish. Thanks! I’m so glad you like the recipe! Thank you for sharing about the water. The addition of roasted squash sounds so good! Hi, I think I have the solution for everyone’s water problem. The cup that comes with the Insta pot. It’s not a true cup. I think some people are using the little plastic cup instead of a regular cup. This by far is the best lentil soup I’ve made. It’s not a watery base soup and more hearty. It’s delicious and full of flavor! Very little salt is needed. Delicious! I added 1 TBSP of lemon with the stock and would recommend for anyone who wants a bright flavor. I just made the Golden Lentil Spinach soup in my instant pot. It was the best lentil soup I’ve ever made. Wow, you are obviously a compensated user/advertiser for the Instant Pot. Any electric pressure cooker will work. I own 2, one is a Cuisanart and the other a Faberware. The price difference between the 2 is about $60, but they do exactly the same and are of the same quality and features. My comments about electric pressure cookers and this recipe specifically are as follows: first buy the largest pressure cooker you can afford. You don’t have to use the full capacity each time but you’ll wish you had a large one if preparing a whole chicken or roast. 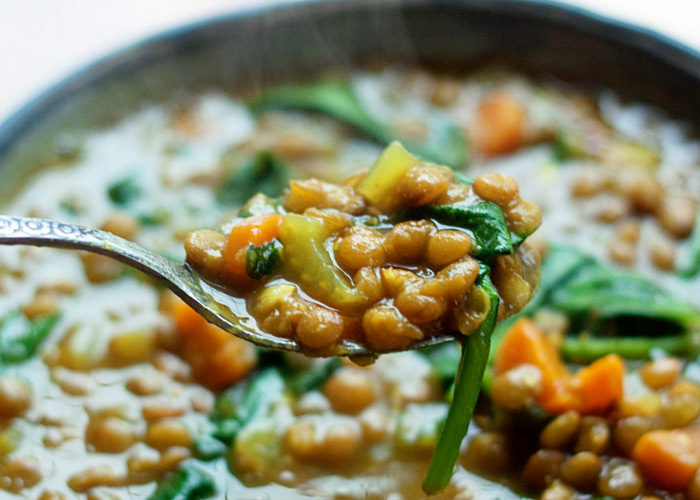 As far as this lentil recipe goes, you can skip the veg sauteing step completely. In my opinion it is unnecessary and does not affect flavor if you skip. The lentils will cook down to nearly a mush in this recipe. Theres nothing wrong with that. But if you prefer your lentils soft but whole, add a 1/4 cup of vinegar or lemon juice. A little less if you prefer less acidic flavor. This recipe is great for split peas too. Add some diced ham or chopped bacon before cooking. No, I am not a compensated user/advertiser. I tried this simple recipe mostly because I had all the ingredients on hand. But it was a lovely surprise, with luxurious flavor. The spices are in balance and the spinach is a real part of the soup, not just a garnish. I did use some chicken stock, and also a less delicate Bloomsdale spinach, but the combination of lentils, vegetable and robust seasoning still shined. I also liked the mini-tutorial on Instant Pot, something we need more of. Hi, I would like to try making this soup tonight, sounds delish! Just wondering if its quite thick? Could I try using 6 cups of broth rather than the 4 as I like a more juicy soup. I know this reply is coming a few days late – I hope you liked the soup! It is somewhat thick, you could always thin out with a little extra veg broth at the end if you like. I had been craving lentil soup for so long and finally found your recipe. Turned out that I hit the Jackpot! I used green lentils and upped the cooking time to 20minutes as suggested in the recipe and it turned out PERFECTLY!! It was Love at first bite!!! Woo hoo! I’m so glad you liked it. Thank you so much for coming back and leaving this review! This soup is wonderful, and more filling than we expected! I used only 1 1/2t cumin, because there was a comment saying 2t was too much, but I wish I had used all 2t. (I used roasted cumin powder.) Thank you! So glad you like this one! Thanks, Susan! This is a great recipe – I’ve made it many, many times. My comment is about the nutrition information. I believe that the carb count is closer to 44 grams per serving. I’m a type one diabetic (newly diagnosed at 46) and had to keep giving myself more insulin because my blood sugar was spiking. This issue probably isn’t as important to others, but I wanted to point it out. Thanks so much, Christy. I’m so glad you like the recipe! I will double check the nutrition information, thank you for letting me know. I have blood sugar issues (insulin resistant, pre-diabetic, so the high carb count is a real problem. I hope someone can guide me to lo-carb alternatives, as the lentil soup recipe would put me over the top for carbs. A link for low-carb or “keto” recipes would be appreciated. Lentils unfortunately aren’t low carb, so I’m not sure I could find you a similar recipe. Have you checked out alldayidreamaboutfood.com? Great keto resource! I read eating spinach soup over 7 days can lower blood pressure. 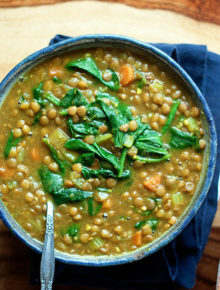 Is there enough spinach in this lentil spinach soup to do that? I’m not sure – maybe check with your doctor?